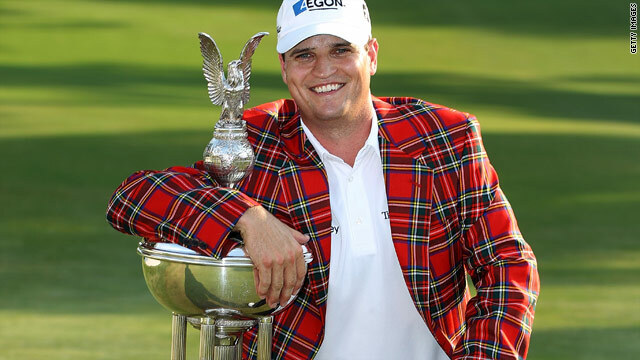 Zach Johnson leapt up to 15th on the U.S. PGA Tour money list with his $1.11 million first prize at Fort Worth. (CNN) -- Zach Johnson revealed that his sports psychologist helped him bounce back from missing the cut at his title defense in Texas by snatching a record-breaking victory at the Crowne Plaza Invitational despite two nerve-wracking weather delays late in Sunday's final round. The 2007 Masters champion missed out on his third successive Texas Open win three weeks out after slumping to an opening 80, but after taking time out to refocus he won by three shots at Colonial in Fort Worth following a second successive six-under-par 64. The 34-year-old took his season earnings to almost $1.7 million after taking home the first prize of $1.11 million, denying England's Brian Davis his first PGA Tour title. "Looking back on recent history, I played San Antonio, I shot 80 the first round, which was probably one of the better things that could have happened to me, because I kind of re-evaluated some things mentally," he told the PGA Tour Web site. "Fortunately, I adjusted pretty quick, went out there and shot four-under the next day with no bogeys and just felt really good. So I missed the cut, went home, had a good off week. "I'm certainly okay with any outcome, but I just wasn't putting that into play and I think, certainly with some help from my sports psychologist Dr. Mo Pickens, just reaffirming that I'm doing the right things, and my coaches and my trainers reaffirm me that I'm doing the right things, and I haven't deviated." It gave Johnson a coveted plaid winner's jacket to go with his green one from Augusta, and elevated him alongside world No. 2 Phil Mickelson as the only players to win a PGA Tour title in each of the past four seasons. Joint overnight leader Davis led by one shot going into the final nine holes, but a string of pars allowed Johnson to catch him, with the American bouncing back from a bogey at 14 to sink a long birdie putt at the next despite an hour-long delay. Johnson also birdied from 15 feet at 17 to go four shots clear before Davis finally picked up another shot in consolation at 18. Johnson parred the last for a tournament-record winning total of 21-under 259, while Davis closed with 68. Johnson's playing partner Ben Crane tied for third on 263 with fellow American Jeff Overton after both shot 67. Bryce Molder, the co-leader after 54 holes, faded with a 70 that left him tied for fifth on 16-under with Scott Verplank, who shot a flawless 65. Mickelson missed the cut as he failed in his second chance this season to overtake Tiger Woods at the top of the world rankings. Woods will return from a neck injury this week to defend his Memorial Tournament title in Ohio, having been forced to withdraw during the final round at the Players Championship on May 9.